Here’s a good little work out that I enjoyed at my old gym! I’m hoping to get some great videos here at Red Fox now that we have our very own building!! Soon… In the mean time, enjoy and try it out for your self! Finish out with 1-2 miles walk/running on T-mill or outside! 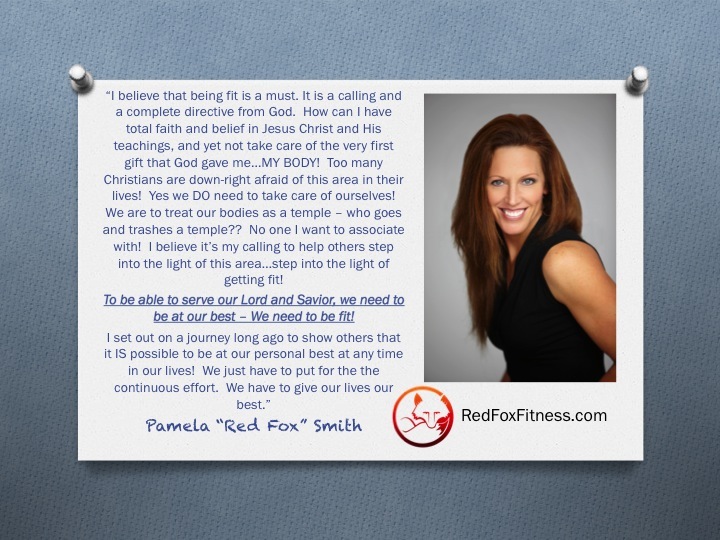 Bi-cepts and Tri-cepts from Pamela “Red Fox” Smith on Vimeo. Any one can achieve the desired results that they are looking for. It takes a decision, a plan of action, accountability, and time. Let’s see what we can do!! For December, Let’s do a little “Boot Camp” type of activity. So, get your stop watches out and your timers ready!! We are going to race ourselves against the clock! On your other days…go for a short run. We are looking for you to do this 3x’s a week. Well??? What do you think?